Wondering what to get for your child’s favorite teacher or the UPS driver who always brings your packages on time? Consider preparing one of these delicious treats and wrapping it in bright, festive packaging. If you do not have time to make your own hand made crafts, 40NORTH Restaurants has gift cards that can be used at any of our 11 locations in New Jersey. Plus, you will receive a $5 bonus gift card for every $25 gift card you purchase! 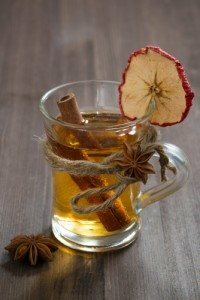 Mulling spices are a great way to perk up apple cider or red wine for the holidays. This simple, flavorful recipe combines oranges and fresh ginger with whole spices. The recipe makes eight packets. Who doesn’t love sweet, crunchy caramel corn? This delicious treat will have the recipient asking for the recipe. The ingredients are simple—popped popcorn, brown sugar, butter, light corn syrup, salt and baking soda. You can add nuts for extra flavor and texture. This sweet and savory recipe is not only tasty—it’s also pretty, especially when packaged in bright holiday colors. You combine rice and corn square cereal (a la Chex) with pretzel twists or sticks, honey-roasted peanuts, white baking pieces and mint-flavored milk chocolate pieces. It takes only 20 minutes to make, and you’ll have 16 cups—enough for several of your favorite people. You can’t go wrong with this gift! This recipe calls for flavorful ingredients such as Granny Smith apples, dried plums, ground cinnamon and granola. It only takes 20 minutes to prepare, and one loaf serves 12 people. It’s great for breakfast or an afternoon snack.